I recently wrote about Future Virgins, stating that the band tempers their anger, choosing more subtle reflection in their songwriting to express that always important human emotion. I guess I know where the band’s members let it out. 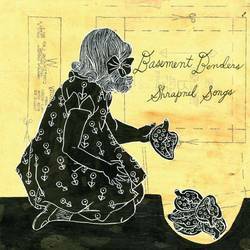 Basement Benders play a somewhat lo-fi melodic punk with a lot of vocal tradeoffs that pull together with joined melodies. It’s a pop structure played at live Ramones speed, sped up as fast as the turntable with spin and filled with personal tones of anger, frustration, regret, and release. It’s punchy and personal, in the vein of Cometbus bands like Pinhead Gunpowder. While I mentioned Future Virgins earlier, the band also features Terry Johnson, formerly of This Bike Is A Pipe Bomb, which is a fitting place to tie my comparisons together. Many of the songs here are in the same key as Future Virgins, while the production fits more with This Bike Is A Pipe Bomb’s catalog. The melodies fit neatly in the middle. It’s rough around the edges, with the vocals cracking in “Teenage Mary,” equally feeling pained and angry, then the different vocalists all join together for the group chorus. For all the namedropping going on here, this isn’t a “sounds like” situation, it’s an amalgamation. “That Day in the Back of the Parking Lot” has the pep of TBIAPB, and the flow of Future Virgins, melded over the never-let-up drums. They do explore more discordant sounds too, as in “Lil Ruby,” where the guitar and vocals swap roles, the angular hook burning its way into your memory. The force of “Watch Your Step” is undeniable, yet the song is danceable at the same time. The chorus of “Gravedigger Jones” is nearly impossible not to shout along to. While I think Future Virgins’ emotion comes largely through the melodic progressions, TBIAPB and now Basement Benders utilize raw emotion that cuts and sizzles. The rhythm section gives a steadying feel as the songs throughout reflect on the very instability of life in America today. To repeat my adjectives from above, it’s emotional, direct, and it feels like a bloodletting. While the band shares their pain, they find solace when harmonies pull together for a moment in every song. DIY punk, in a nutshell, is about finding a community amid the pain and frustration we feel every day. With Shrapnel Songs, the band has found twelve metaphors. Posted March 18, 2019, 6:33 p.m.